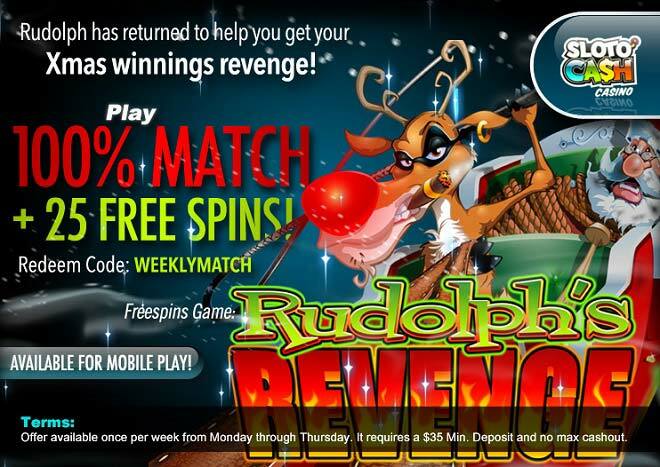 Win More This Season With Rudolph's 100% Weekly Bonus + 25 Xmas Spins! Everyone loves Rudolph – of course, he’s the one that shows Santa the way towards our homes in hopes of receiving gifts! But this year he’s had it and wants a break! Help Rudolph break free from his shores and you’ll get to play with a 100% Weekly Match plus 25 Free Spins! Spin the reels of The Return of the Rudolph this December and you’ll be spinning major wins free spins, multipliers, wilds and more in the Santa Strikes Back feature, the Rudolph’s Rampage feature, and the Rudolph’s Revenge game! Working for Santa has taken Rudolph to the limit – and he wants a vacation while you collect huge wins this holiday season!